We are very proud to have been awarded a Silver Medal as all products considered are tried, tested and reviewed by the people who really matter – children and their carers. Every product is scored for appeal to children, durability, adaptability, educational value and value for money so it’s a great honour to know TomTag meets all these criteria. Joanna Grace is a special educational needs (SEN) and disabilities consultant who writes educational resources and sensory stories for individuals with SEN. Recently Joanna successfully ran The Sensory Story Project, to create a set of self resourcing sensory stories that parents, as well as teachers, could afford to buy. 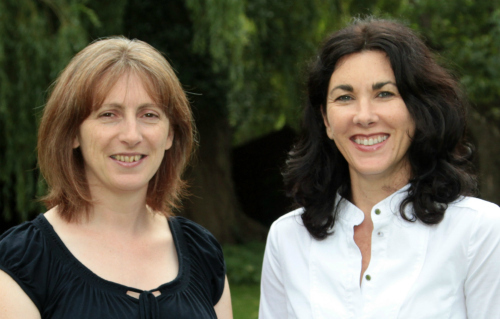 Orkid Ideas are proud to have been one of the backers of The Sensory Story Project. We invited Joanna to talk about the overlap between provision for children with special needs and provision for mainstream children and we’re delighted to share her thoughts with you here. Many of the teaching methods and resources used in mainstream schools currently were originally developed for children with special needs. Classrooms have visual time tables, teachers think about the different learning styles of their pupils: visual, auditory, kinaesthetic, and nursery schools sign with their tots. It makes sense that anything which amplifies learning for a child with special needs will also amplify learning for mainstream children. Meeting the challenges to learning for children presented by special needs enriches provision for all, it’s one of the wonderful effects inclusion has for all children. I write sensory stories for individuals with profound and multiple learning difficulties for whom they offer the opportunity to engage with a range of sensory stimuli, develop their confidence, communication and increase their opportunities for socialising as well as giving their carers insight into ways of personalising their care. They’re a great resource and so much fun, and they work well with children who do not have any special needs. 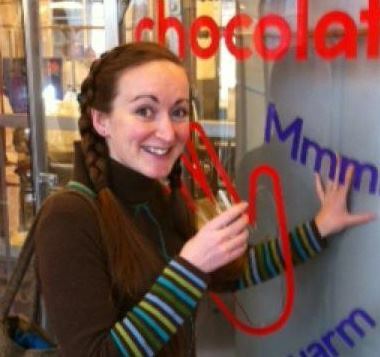 Joanna touching a vat of hot melted chocolate whilst eating melted chocolate – one of her favourite sensory experiences! Cognitive development, for all of us, relies on sensory stimulation. If we use our senses when we learn more of our brain is involved in our learning, quite literally more of it; and if more is involved then we’ve more chance of remembering. A sensory story combines a concise narrative (typically less than 10 sentences) with a sequence of sensory experiences. I have written stories about the birth of stars in stellar nurseries, about the history of Victorian feminism, about fantasy adventures and about every day activities. I’ve written stories for Worldstories, Booktrust, Kensington Palace, the Holocaust Memorial Day Trust and lots more lovely organisations. You can pack a lot of information into a small number of words; and you can also unpack all that information from a small number of words. When I revised for my exams at school I would take notes, and then take notes on my notes, and notes on my notes etc. Eventually I’d end up with a few sentences from which I could generate everything I knew about a topic. If those sentences had been accompanied by sensory stimuli I’d have been even more likely to remember them, and the process of revision would have been more fun. It is good for everyone to recognise that communication isn’t solely reliant on language. Children who don’t have special needs can still struggle with speaking in public, or organising their thoughts into language. Think of that adage: a picture speaks a thousand words. Through using sensory stimuli to tell a story children who aren’t quite as adept at verbal communication can speak thousands upon thousands of words, through smells, tastes, touches, sights and sounds. I’ve had lovely conversations with young people in mainstream nursery, primary and secondary schools, and yes – even a few universities, who’ve enjoyed learning in a sensory way and have begun to consider who these stories might have been written for. They can be a great tool for disability awareness. Whether it’s your child’s very first day at school or they’re just starting a new school year, here’s our A-Z guide to help ease you gently back into the school routine. Choosing a fun model and showing kids how to operate it is a great way to teach them good time-keeping. Have you got an up-to-date timetable and a vaild child’s bus pass? Does your child know where they are going to be dropped off and picked up? Have a trial run so it’s not left to the first morning! Think beyond the first week of school and put important dates such as parents evenings, inset days and holidays in your calendar now. Set aside a designated place where the kids can leave their bags, coats and school books so it doesn’t all end up in a heap by the end of the first week. Make a clean start with an empty bag and clear out anything still lurking in there from last term. Have you got contact details of another parent at your child’s school who you can ask about school events if letters /permission slips don’t make it home? Have you got the right stuff for P.E. and perhaps a seperate bag to put it all in? If you still have time before the first day of school, make sure they get a good cut so you don’t need to drag tired kids out after school or at the weekend to get it done. If your kids are starting new schools, it’s time to dig out any information books you have received from the school and make sure you’re familiar with their routine and policies. Get involved with the school community and join the PTA or check out after school activities the kids may want to join. If your kids are older do they have a spare key? Get one now rather than wait until first morning back! L is for LABEL EVERYTHING! We can’t shout this one loud enough!! Iron, sew, stamp or write your kids’ name on all clothing, shoes & personal items otherwise your jumper will look like all the rest in the lost property mountain! Make sure the school has up to date medical information for each child with details of allergies and emergency contact numbers. Remind your child to bring ALL notes home from school and check their bag each night for anything lurking in the bottom! Have you bought one yet? It won’t be long before those cold days and dark nights start creeping in! If your school doesn’t provide one, look for a suitable notebook or diary to use as a homework planner, an essential for those kids starting high school. Don’t forget that school can be stressful and tiring and that kids need to spend time away from homework, TV and other electronic distractions. Try and set aside some time to chat with them each day so you can pick up on any worries they may have. Donate old school uniform to charity or for good quality articles check whether the school PTA runs a second hand uniform sale. Check with the school what items your kids need to bring and make a regular check to see if anything needs replacing. The essential tool to help kids pack their bag to school! Making sure you start the year fully equipped will avoid any panics later and help children to feel more confident. Find our if your school offers vision screening and if not, remember to get your kids’ eyes checked regularly as it’s important to pick up any problems as early as possible. Check your school’s site regularly for useful dates, school policies and curriculum guides. Let kids choose what they want to participate in rather than what you want them to. You never know what hidden talents you might uncover! Remember to check your school website or ask at school for details of what your kids will be studying this academic year so you can stay ahead of the game. As the nights draw in, get into a sleep routine for school. Just don’t forget to set the alarm clock!